Why do You Crave Salt When You Have Adrenal Fatigue? Have you felt tired and stressed lately and noticed that you are constantly reaching for the potato chips and salty pretzels? Do you find yourself wanting to add salt to everything you eat? There is a reason you crave salt in particular when you experience stress, since a craving is usually your body’s way of letting you know it has an unmet nutritional need. Here is what you need to know about why you crave salty foods when your adrenal glands are taxed and how to naturally restore your adrenal balance. When we are under stress, we tend to crave things like potato chips, olives, or other salty foods. Since stress also leaves us craving foods such as sweets and other simple carbohydrates, we usually think of this as nothing more than our seeking our favorite comfort foods to help calm us, although these are also symptoms of adrenal fatigue. However, there is a reason you crave salt in particular when you experience stress, since a craving is usually your body’s way of letting you know it has an unmet nutritional need. But what about salt’s association with hypertension—aren’t we supposed to avoid salt in our diets? 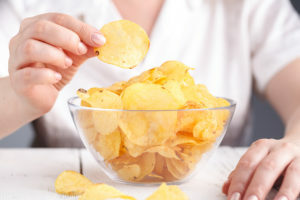 Here is what you need to know about why you crave salty foods when your adrenal glands are taxed, whether or not you should give in to your cravings, and how to naturally restore your adrenal balance. Have you ever noticed that when you receive even the slightest shock, your heart rate instantly elevates, you feel a burst of energy, and your awareness increases? This is due to your body’s “fight or flight” survival mechanism which triggers your adrenal glands (AKA the HPA axis) to provide a burst of energy-inducing hormones such as epinephrine and cortisol when it senses danger. At the same time, your body releases simple sugars into your bloodstream to fuel your muscles and ensure you are at your strongest and fastest. All of this is meant to give you the strength, energy and mental clarity to either fight or run from the danger, after which everything returns to normal once you are safe again. However, when your system is continuously bombarded with stress, your pituitary, hypothalamus and adrenal glands all become taxed to the point they are unable to keep up with the extra hormone production. This can be any type of stress, such as keeping up with a busy work pace, commuting, financial pressures or a death in the family, all of which can cause a stress response. Unfortunately, many of these conditions can also lead to other dangerous health problems, such as stroke, heart failure or diabetes, which is why returning your adrenals back to balanced is so important. When you experience adrenal insufficiency, one of the hormones your body increases the production of is aldosterone, which is in a class of hormones known as mineralocorticoids. Since mineralocorticoids are responsible for regulating concentrations of minerals in the body, they are necessary for the body’s healthy fluid levels and electrolyte balance. However, underproduction of aldosterone (hypoaldosteronism) leads to low blood pressure and salt cravings, as well as a few other problems associated with low output. Interestingly, a 2011 study performed by assistant research professor Eric Krause, PhD, at the UC department of psychiatry and behavioral neuroscience shows us that lab rats that received high levels of sodium chloride (salt) had a lower stress response than those which did not. One of the reasons adrenal support is so important to your health is your body’s safe regulation of aldosterone and its effects on blood pressure. Since the hormone sends signals to organs such as the kidneys and colon to either increase or decrease the amount of sodium in the bloodstream and potassium in the urine, it has the ability to either increase or decrease blood volume and to control blood pressure. This means that low production of aldosterone, such as from adrenal insufficiency, can lead to low blood pressure, a rapid pulse, and low energy. 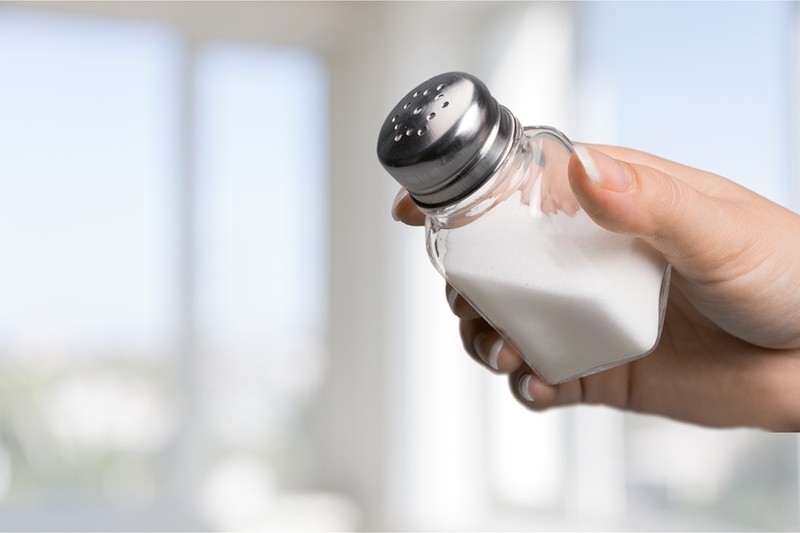 Since aldosterone deficiency causes low blood sodium (along with high levels of potassium), your body sends out cravings to tell you it needs more salt. While salt is an essential mineral, much of what we consume in processed foods has been processed to the point of having little nutritional value. This is because conventional salt has been superheated to 1200o Fahrenheit while under high pressure, which destroys most of salt’s beneficial compounds. It is then bleached and fortified with iodine, along with anti-caking compounds and additives to slow moisture absorption, although no other essential minerals are readded. Of course, the results are a less-than-healthy product that is best replaced with the type of natural salt which has the most nutritional benefit for you. Himalayan Pink Salt—Himalayan salt is naturally pink in color from its high levels of iron and other essential minerals. In fact, it is considered by many to be the healthiest salt there is, and it has 84 essential trace elements which are required by your body. Sea Salt—Sea salt has naturally occurring levels of iodine, along with other trace minerals. However, it doesn’t have the same high levels of iodine as is added to table salt, so adding such iodine-rich seafoods as seaweed or ocean fish to your diet is a recommended way to get more of it, since it is also critical for adrenal support. Black Salt—Black salt is an unrefined volcanic salt. In addition to containing essential trace minerals, it gets its black color from activated charcoal, which is good for digestion and helps in detoxing the body. Persian Blue Salt—This salt comes from an ancient lake in Iran and gets its beautiful blue color from the effects of thousands of years of the earth’s compression. It is rich in minerals and has a slightly sweet flavor. Licorice—The glycyrrhizin acid which is naturally occurring in licorice has the ability to deactivate an enzyme produced by your body (HDS-11B) which breaks down cortisol and aldosterone in the kidneys. Since cortisol is similar enough in makeup to aldosterone that it hijacks the aldosterone receptors, this means that consumption of licorice can help prevent the effects of adrenal fatigue. Perspiring—Sweating decreases the amount of fluids in your body, which increases the concentration of salt in the bloodstream. However, prolonged dehydration is not advised, and fluids along with electrolytes should be consumed after perspiring heavily, such as post-exercise. Adaptogens—A group of herbs know of as adaptogens such as eleuthero, ashwagandha and rhodiola rosea have the ability to either increase or decrease hormone production as needed, which is how they help you adapt to stress. Due to the reputation of sodium and its association with hypertension, salt may not be the first thing you may think of as a healing supplement. However, when adrenal fatigue leaves you craving salty foods, it is best to listen to your cravings, since increasing your body’s salt level is just what you need to help restore your healthy hormone production. Do you have symptoms of adrenal fatigue? Are you experiencing fatigue and stress? Are you not able to get your energy back? Take our symptom checker to find out if your adrenal glands could be overworked. We can help. By restoring your hormones to normal levels, we can help you overcome adrenal fatigue and get your energy and vitality back!